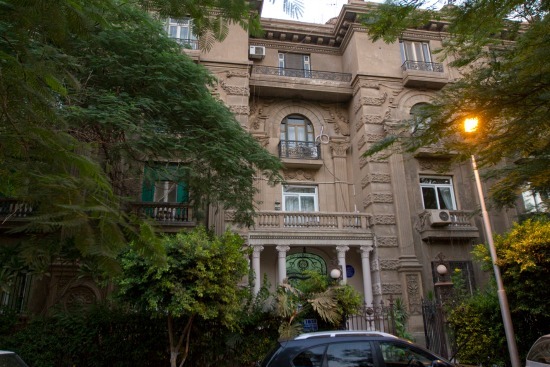 In Garden City, one of the few neighbourhoods where one can still immerse oneself in Cairo's Belle Epoque architecture, a new space for the arts has opened its doors. "Room," a basement space, is composed of two separate elements: a cafe, and a room capable of hosting an array of artistic events. Officially opening its doors to the public 14 August, "Room" has been an idea in the making for several months. Ahmed Zeidan, founder of "Room" who is also a cameraman and aspiring filmmaker, stumbled upon the space at the start of the summer and immediately saw its potential. “I used to host movie nights, theatre rehearsals and other things in my house in Garden City,” Zeidan told Ahram Online, explaining that when he first saw the space it looked entirely different than it looks now. “We tore down all the walls to make the two large rooms hosting the cafe and the art space." The art room is designed to serve several purposes with small tweaks. 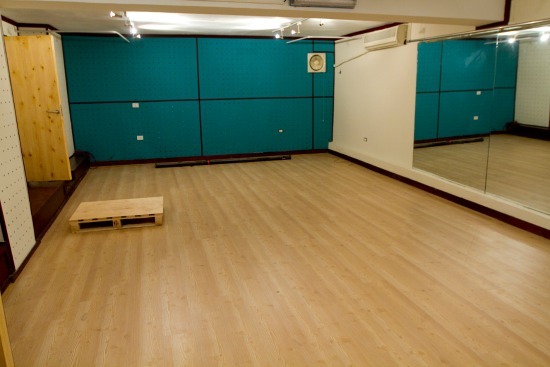 The large air-conditioned room has hardwood floors and a mirror that covers an entire wall to help with dance classes. Curtains cover the mirror for other events. A stage that can be assembled and dismantled in minutes is present, and a screen can be pulled down for film screenings and chairs and beanbags can be summoned from storage for seating. "Room" is keen on serving an array of artistic needs at no cost. While dance classes, which are being organised by contemporary dancer Mirette Mechail, are going to be paid, most other events — such as film screenings and concerts — will be free of charge. The space has a long list of artistic disciplines it plans to accommodate: performances, concerts, film screenings, exhibitions, rehearsals, talks and lectures. So far Room has hosted a concert by electronic music and spoken word duo Ahmed Saleh and Abdallah Miniawy on its opening night. The concert, much like many music events planned to be hosted, was curated by Eka3's Al-Moharek, a booking agency working to promote independent Arabic music. With regional artists such as Maryam Saleh and Zeid Hemdan, Like Jelly and Tamer Abu Ghazala under their belt, one can predict an interesting line-up of musicians to appear at Room. One way Room wants to host music is via an idea they are calling "Tiny Afternoon Concerts" where they host a musician during the day, and concerts are announced only hours in advance, to allow for an intimate setting with the audience. On Saturday, 23 August, Room hosted a talk by heritage group Al-Tohfageya where they spoke of the history of Arabic music from the 1920s until now. So far the events are planned one at a time. Zeidan is still looking into copyright issues to screen films, and the dance classes are set to commence in September. Room is working on a financial model that is self-sustainable. Through the cafe, which sells high quality coffee, beverages and sandwiches, along with the dance classes fees, Zeidan hopes the space will be self-sufficient and maybe even generate profit in the long-run. Most art spaces that offer independent or alternative art are reliant on grants from embassies and donors. 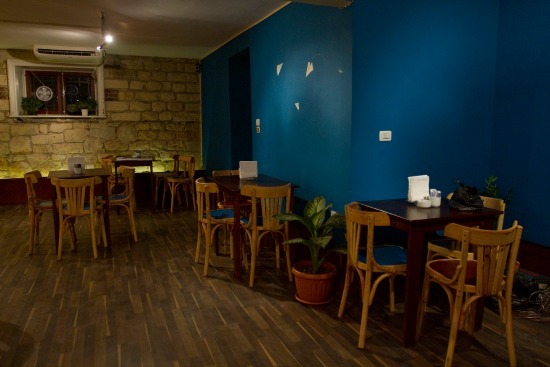 It is to be hoped that art spaces such as Room, Falak in Garden City, Mizan in Maadi, Kaffein in Downtown, or Sufi in Zamalek, which all run cafes parallel to the art space, can find the means to sustain themselves. Cafes are a smart way to go forward. Given the success the food and beverage industry has been seeing in an otherwise depressed economy, offering people high quality food, a space to have meetings and gather socially, or to sit and work in the afternoons, with regular caffeine fixes, could serve to sustain artistic events, becoming a transferable model. Room is also exploring options on how people who use the art space can contribute in ways that are not financial. The organisers are toying with the idea to have Room's logo on brochures of plays that are rehearsed in their space, among other ideas. When we walked into Room, a playlist of 90s music filled the space. Zeidan even let Ahram Online contribute to it. Another one of Room's quirky additions is a "Blackout Menu," which people can order from whenever power is cut in the neighbourhood. 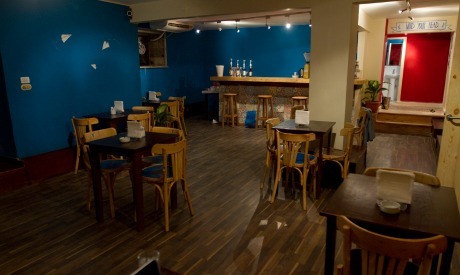 The cafe area hosts a buletin board, a book case, and beatifully painted blue walls with small hand drawn paintings of paper planes. One wall has its original stonework completely bare of plaster. According to Zeidan, a team of heritage specialists came in to remove the plaster, which took a full week of intricate work to get done. The building that hosts Room carries its own historical significance. According to stories from veteran neighbours, the building served as the Cairo headquarters of the British Army in 1941, a location where many strategic decisions related to World War II were made, and where figures such as Charles de Gaulle are believed to have visited. When in correspondance referencing the location at 10 Tombolat Street — before the street name was changed to Mohameyeen El-Arab — officers wrote of "Grey Pilliars" or "Number 10." Later, some of the buildings floors were used as prisons during the British occupation. And both Syrian and Lebanese independence were negotiated within these very walls. Now, Room brings light back in to this historic building, giving the city's vibrant art scene a place within this wonderful architectural gem. They failed to develop art work to describe our popular revolution. We need plays, music's, paint galleries, movies, poems, folklore, ... to capture these moments in Egypt history and to educate the masses about our accomplishments and future effort rebuild Egypt. Shame on you!